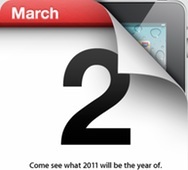 Apple Special Event: The year of the iPad2? Shane Richmond & Emma Barnett for The Daily Telegraph, UK … they are blogging since 01:00 PST / 10:00 MEZ. Ars Technica … live blog will start with the special event (ScribbleLive). John Paczkowski for AllThingsDigital …live blog will start with the special event. Josh Lowensohn for CNet … live blog will start with the special event (Demand-Media). Adrian Kingsley-Hughes for ZDNet … live blog will start with the special event (Demand-Media).